Vesicles and vacuoles are membrane-bound sacs that function in storage and transport. 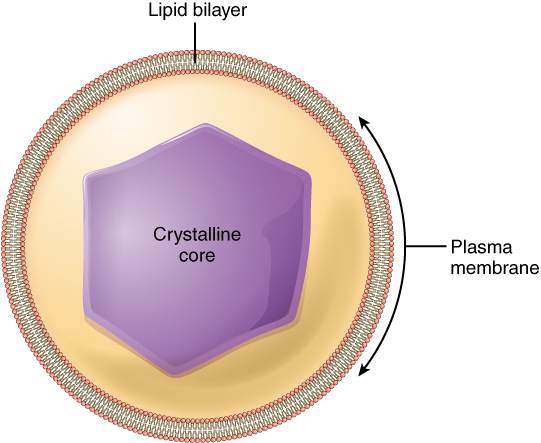 Vesicles are small structures within a cell, consisting of fluid enclosed by a lipid bilayer involved in transport, buoyancy control, and enzyme storage. Lysosomes, which are found in animal cells, are the cell’s “garbage disposal.” The digestive processes take place in these, and enzymes within them aid in the breakdown of proteins, polysaccharides, lipids, nucleic acids, and worn-out organelles. Central vacuoles, which are found in plants, play a key role in regulating the cell’s concentration of water in changing environmental conditions. Vesicles and vacuoles are membrane-bound sacs that function in storage and transport. Other than the fact that vacuoles are somewhat larger than vesicles, there is a very subtle distinction between them: the membranes of vesicles can fuse with either the plasma membrane or other membrane systems within the cell. The membrane of a vacuole does not fuse with the membranes of other cellular components. Additionally, some agents within plant vacuoles, such as enzymes, break down macromolecules. A vesicle is a small structure within a cell, consisting of fluid enclosed by a lipid bilayer. 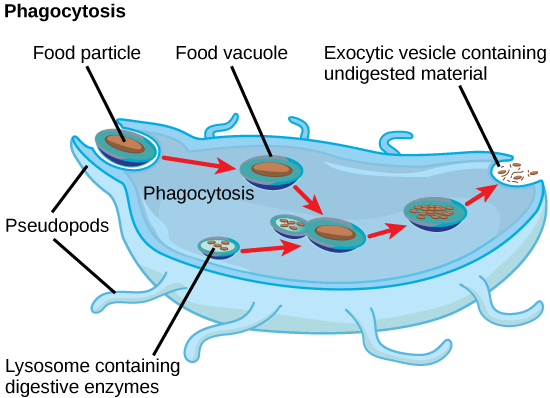 Vesicles form naturally during the processes of secretion (exocytosis), uptake (phagocytosis) and transport of materials within the cytoplasm. Alternatively, they may be prepared artificially, in which case they are called liposomes. Vesicles can fuse with the plasma membrane to release their contents outside the cell. Vesicles can also fuse with other organelles within the cell. Animal Cell: In this animal cell illustration #4 denotes a vacuole. Vesicles perform a variety of functions. Because they are separated from the cytosol, the inside of a vesicle can be different from the cytosolic environment. For this reason, vesicles are a basic tool used by the cell for organizing cellular substances. Vesicles are involved in metabolism, transport, buoyancy control, and enzyme storage. They can also act as chemical reaction chambers. Animal cells have a set of organelles not found in plant cells: lysosomes. Lysosomes are a cell’s “garbage disposal.” Enzymes within the lysosomes aid the breakdown of proteins, polysaccharides, lipids, nucleic acids, and worn-out organelles. These enzymes are active at a much lower pH than that of the cytoplasm. Therefore, the pH within lysosomes is more acidic than the pH of the cytoplasm. Many reactions that take place in the cytoplasm could not occur at a low pH, so again, the advantage of compartmentalizing the eukaryotic cell into organelles is apparent. Vacuoles are an essential component of plant cells. If you look at the figure below, you will see that plant cells each have a large central vacuole that occupies most of the area of the cell. The central vacuole plays a key role in regulating the cell’s concentration of water in changing environmental conditions, and houses the digestive processes. Have you ever noticed that if you forget to water a plant for a few days, it wilts? That’s because as the water concentration in the soil becomes lower than the water concentration in the plant, water moves out of the central vacuoles and cytoplasm. As the central vacuole shrinks, it leaves the cell wall unsupported. This loss of support to the cell walls of plant cells results in the wilted appearance of the plant. 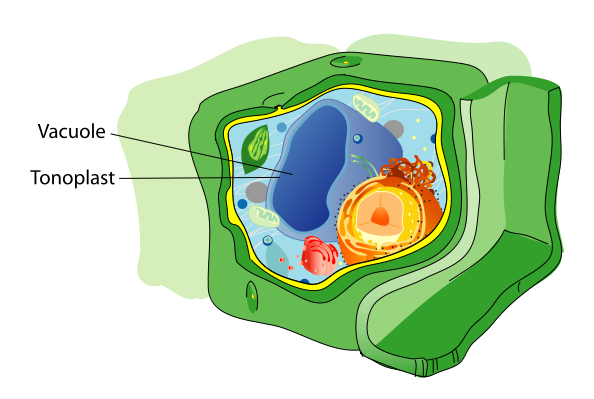 Plant Cell Structure: The Central Vacuole in a typical plant cell is quite large and is surrounded by the tonoplast or vacuolar membrane. The central vacuole also supports the expansion of the cell. When the central vacuole holds more water, the cell gets larger without having to invest a lot of energy in synthesizing new cytoplasm. Contractile vacuoles are found in certain protists, especially those in Phylum Ciliophora. These vacuoles take water from the cytoplasm and excrete it from the cell to avoid bursting due to osmotic pressure. The endoplasmic reticulum is an organelle that is responsible for the synthesis of lipids and the modification of proteins. If the endoplasmic reticulum (ER) has ribosomes attached to it, it is called rough ER; if it does not, then it is called smooth ER. The proteins made by the rough endoplasmic reticulum are for use outside of the cell. Functions of the smooth endoplasmic reticulum include synthesis of carbohydrates, lipids, and steroid hormones; detoxification of medications and poisons; and storage of calcium ions. lumen: The cavity or channel within a tube or tubular organ. The endoplasmic reticulum (ER) is a series of interconnected membranous sacs and tubules that collectively modifies proteins and synthesizes lipids. However, these two functions are performed in separate areas of the ER: the rough ER and the smooth ER. The hollow portion of the ER tubules is called the lumen or cisternal space. The membrane of the ER, which is a phospholipid bilayer embedded with proteins, is continuous with the nuclear envelope. The rough endoplasmic reticulum (RER) is so named because the ribosomes attached to its cytoplasmic surface give it a studded appearance when viewed through an electron microscope. Ribosomes transfer their newly synthesized proteins into the lumen of the RER where they undergo structural modifications, such as folding or the acquisition of side chains. These modified proteins will be incorporated into cellular membranes—the membrane of the ER or those of other organelles —or secreted from the cell (such as protein hormones, enzymes ). The RER also makes phospholipids for cellular membranes. If the phospholipids or modified proteins are not destined to stay in the RER, they will reach their destinations via transport vesicles that bud from the RER’s membrane. Since the RER is engaged in modifying proteins (such as enzymes, for example) that will be secreted from the cell, the RER is abundant in cells that secrete proteins. This is the case with cells of the liver, for example. 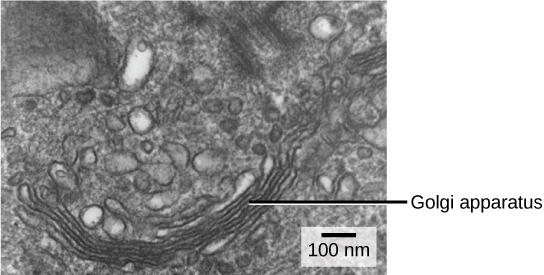 Rough Endoplasmic Reticulum: This transmission electron micrograph shows the rough endoplasmic reticulum and other organelles in a pancreatic cell. The smooth endoplasmic reticulum (SER) is continuous with the RER but has few or no ribosomes on its cytoplasmic surface. Functions of the SER include synthesis of carbohydrates, lipids, and steroid hormones; detoxification of medications and poisons; and storage of calcium ions. In muscle cells, a specialized SER called the sarcoplasmic reticulum is responsible for storage of the calcium ions that are needed to trigger the coordinated contractions of the muscle cells. The Golgi apparatus sorts and packages materials before they leave the cell to ensure they arrive at the proper destination. The Golgi apparatus is a series of flattened sacs that sort and package cellular materials. The Golgi apparatus has a cis face on the ER side and a trans face opposite of the ER. The trans face secretes the materials into vesicles, which then fuse with the cell membrane for release from the cell. vesicle: A membrane-bound compartment found in a cell. We have already mentioned that vesicles can bud from the ER and transport their contents elsewhere, but where do the vesicles go? Before reaching their final destination, the lipids or proteins within the transport vesicles still need to be sorted, packaged, and tagged so that they wind up in the right place. Sorting, tagging, packaging, and distribution of lipids and proteins takes place in the Golgi apparatus (also called the Golgi body), a series of flattened membranes. The Golgi apparatus sorts and packages cellular products: The Golgi apparatus in this white blood cell is visible as a stack of semicircular, flattened rings in the lower portion of the image. Several vesicles can be seen near the Golgi apparatus. The receiving side of the Golgi apparatus is called the cis face. The opposite side is called the trans face. The transport vesicles that formed from the ER travel to the cis face, fuse with it, and empty their contents into the lumen of the Golgi apparatus. As the proteins and lipids travel through the Golgi, they undergo further modifications that allow them to be sorted. The most frequent modification is the addition of short chains of sugar molecules. These newly-modified proteins and lipids are then tagged with phosphate groups or other small molecules so that they can be routed to their proper destinations. Finally, the modified and tagged proteins are packaged into secretory vesicles that bud from the trans face of the Golgi. While some of these vesicles deposit their contents into other parts of the cell where they will be used, other secretory vesicles fuse with the plasma membrane and release their contents outside the cell. In another example of form following function, cells that engage in a great deal of secretory activity (such as cells of the salivary glands that secrete digestive enzymes or cells of the immune system that secrete antibodies) have an abundance of Golgi. In plant cells, the Golgi apparatus has the additional role of synthesizing polysaccharides, some of which are incorporated into the cell wall and some of which are used in other parts of the cell. Lysosomes are organelles that digest macromolecules, repair cell membranes, and respond to foreign substances entering the cell. Lysosomes breakdown/digest macromolecules (carbohydrates, lipids, proteins, and nucleic acids), repair cell membranes, and respond against foreign substances such as bacteria, viruses and other antigens. Lysosomes contain enzymes that break down the macromolecules and foreign invaders. Lysosomes are composed of lipids and proteins, with a single membrane covering the internal enzymes to prevent the lysosome from digesting the cell itself. Lysosomes are found in all animal cells, but are rarely found within plant cells due to the tough cell wall surrounding a plant cell that keeps out foreign substances. lysosome: An organelle found in all types of animal cells which contains a large range of digestive enzymes capable of splitting most biological macromolecules. A lysosome has three main functions: the breakdown/digestion of macromolecules (carbohydrates, lipids, proteins, and nucleic acids), cell membrane repairs, and responses against foreign substances such as bacteria, viruses and other antigens. When food is eaten or absorbed by the cell, the lysosome releases its enzymes to break down complex molecules including sugars and proteins into usable energy needed by the cell to survive. If no food is provided, the lysosome’s enzymes digest other organelles within the cell in order to obtain the necessary nutrients. In addition to their role as the digestive component and organelle-recycling facility of animal cells, lysosomes are considered to be parts of the endomembrane system. Lysosomes also use their hydrolytic enzymes to destroy pathogens (disease-causing organisms) that might enter the cell. A good example of this occurs in a group of white blood cells called macrophages, which are part of your body’s immune system. In a process known as phagocytosis or endocytosis, a section of the plasma membrane of the macrophage invaginates (folds in) and engulfs a pathogen. The invaginated section, with the pathogen inside, then pinches itself off from the plasma membrane and becomes a vesicle. The vesicle fuses with a lysosome. The lysosome’s hydrolytic enzymes then destroy the pathogen. Lysosomes digest foreign substances that might harm the cell: A macrophage has engulfed (phagocytized) a potentially pathogenic bacterium and then fuses with a lysosomes within the cell to destroy the pathogen. 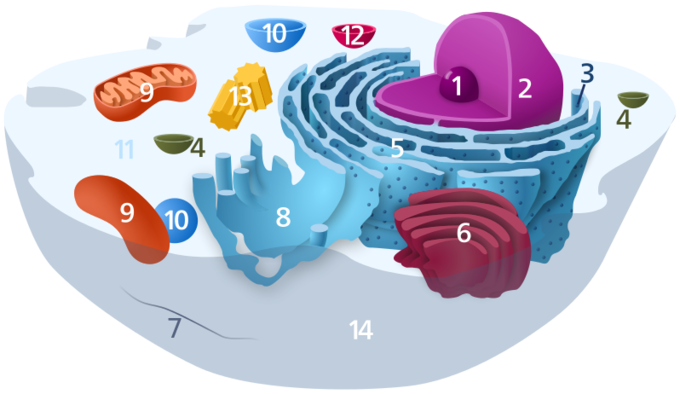 Other organelles are present in the cell but for simplicity are not shown. A lysosome is composed of lipids, which make up the membrane, and proteins, which make up the enzymes within the membrane. Usually, lysosomes are between 0.1 to 1.2μm, but the size varies based on the cell type. The general structure of a lysosome consists of a collection of enzymes surrounded by a single-layer membrane. The membrane is a crucial aspect of its structure because without it the enzymes within the lysosome that are used to breakdown foreign substances would leak out and digest the entire cell, causing it to die. Lysosomes are found in nearly every animal-like eukaryotic cell. They are so common in animal cells because, when animal cells take in or absorb food, they need the enzymes found in lysosomes in order to digest and use the food for energy. On the other hand, lysosomes are not commonly-found in plant cells. Lysosomes are not needed in plant cells because they have cell walls that are tough enough to keep the large/foreign substances that lysosomes would usually digest out of the cell. Peroxisomes neutralize harmful toxins and carry out lipid metabolism and oxidation reactions that break down fatty acids and amino acids. Lipid metabolism and chemical detoxification are important functions of peroxisomes. Peroxisomes are responsible for oxidation reactions that break down fatty acids and amino acids. Peroxisomes oversee reactions that neutralize free radicals, which cause cellular damage and cell death. Peroxisomes chemically neutralize poisons through a process that produces large amounts of toxic H2O2, which is then converted into water and oxygen. The liver is the organ primarily responsible for detoxifying the blood before it travels throughout the body; as a result, liver cells contain large amounts of peroxisomes. free radical: Any molecule, ion or atom that has one or more unpaired electrons; they are generally highly reactive and often only occur as transient species. A type of organelle found in both animal cells and plant cells, a peroxisome is a membrane-bound cellular organelle that contains mostly enzymes. Peroxisomes perform important functions, including lipid metabolism and chemical detoxification. They also carry out oxidation reactions that break down fatty acids and amino acids. Peroxisomes: Peroxisomes are membrane-bound organelles that contain an abundance of enzymes for detoxifying harmful substances and lipid metabolism. In contrast to the digestive enzymes found in lysosomes, the enzymes within peroxisomes serve to transfer hydrogen atoms from various molecules to oxygen, producing hydrogen peroxide (H2O2). In this way, peroxisomes neutralize poisons, such as alcohol, that enter the body. In order to appreciate the importance of peroxisomes, it is necessary to understand the concept of reactive oxygen species. Reactive oxygen species (ROS), such as peroxides and free radicals, are the highly-reactive products of many normal cellular processes, including the mitochondrial reactions that produce ATP and oxygen metabolism. Examples of ROS include the hydroxyl radical OH, H2O2, and superoxide (O−2). Some ROS are important for certain cellular functions, such as cell signaling processes and immune responses against foreign substances. Many ROS, however, are harmful to the body. Free radicals are reactive because they contain free unpaired electrons; they can easily oxidize other molecules throughout the cell, causing cellular damage and even cell death. Free radicals are thought to play a role in many destructive processes in the body, from cancer to coronary artery disease. Peroxisomes oversee reactions that neutralize free radicals. They produce large amounts of the toxic H2O2 in the process, but contain enzymes that convert H2O2 into water and oxygen. These by-products are then safely released into the cytoplasm. Like miniature sewage treatment plants, peroxisomes neutralize harmful toxins so that they do not cause damage in the cells. The liver is the organ primarily responsible for detoxifying the blood before it travels throughout the body; liver cells contain an exceptionally high number of peroxisomes.